Christie's New York has announced Americana Week 2011, a fortnight of sales and viewings devoted to American craftsmanship in all its forms including important furniture, folk art, silver and decorative arts. This year's impressive line-up of sales promises two spectacular additions: a dedicated sale of Native American art, and a second installment of fine 17th and 18th century pottery from the celebrated collection Syd Levethan: The Longridge Collection. Expertly curated by Native American Art scholar John Molloy, the Native American Art sale of January 18 brings together a select assortment of pottery, baskets, textiles, beadwork and jewellery which showcase the artistic achievements of the indigenous population of North America. The complete sale of 147 items is expected to realise in excess of $1.5 million. Leading the sale is a rare Deer Hide Woodlands Painted Shirt estimated at $250,000-300,000, attributed to Illinois circa 1740. It offers a stunning example of the advanced aesthetic of the Native population during the late 18th century, this shirt will be the lead piece in an upcoming show at the Denver Art Museum devoted to the craft. 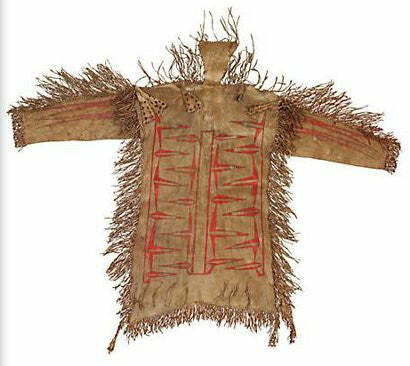 Paralleled only by the distinctive robes at the Musée de Quai Branly in Paris, this shirt is the finest object of its type ever to become available at auction. The sales begin January 18 with Native American Art, followed by Important American Silver on January 20, American Furniture and Folk Art on January 21, Syd Levethan: The Longridge Collection on January 24, and Chinese Export Art on January 25. With over 1,000 lots offered in total, Americana Week 2011 is expected to realise in excess of $12 million. Watch this space for upcoming news on the sales.